Parents need expert advice handling the murky waters when a teen threatens to run or seems to have run away. Most do come home safe and sound, still a few vanish forever. So worrying is normal. IMAGE FROM Roshrulez, who blogged about running away. When a six year old marches defiantly out of the house, it is a laughing matter; not so when a teen stamps out in anger, spewing anger and saying, “I’m out’a here and for good.” More often than not in the heat of the anger, parents might think, “Good and keep going.” But reality quickly sets in if the child is gone too long. Many of the foster children David and I cared for had run away before coming to live with us. We were a temporary home while the courts decided the child’s fate. Living peacefully with us, was the best strategy for getting a sympathic hearing from the judge who had to decide where to send you when it came time to leave our care. Few teens living with us took advantage of that fact. For some of our kids, running had become an ingrained habit. Some of those eventually fell prey to pimps and I am not just talking about the girls. It did not take us long to figure out how to best deal with running away. 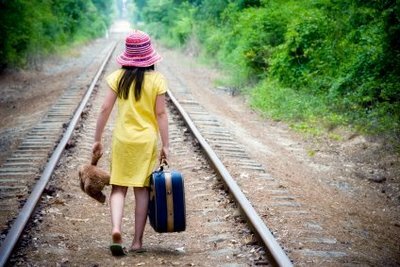 People too often assume a child is running away from something and begin looking askance at parents. Wrong. True some run from abuse; but when running from something it is often a ploy to get what the child sees as unreasonable rules changed. Then there are the kids that are running to something: a love, a party the parents said no too, excitement, or in a few scenarios to drugs. Each needs a different approach, but here are a few tips to start you off. Tip one: If a kid is picking a fight or running out of the house, cursing you so the neighbors will hear – a prime Gotcha War Tactic; yell to her departing back “Come home when you have calmed down.” Makes you the good guy in your neighbors eye, but mostly gives the kid a face saving way to come home. Tip two: Don’t panic. Most kids return home safe and sound. Usually, when a good kid is doing the running away it starts with a Gotcha War fight or a curfew violation (Get a free copy of my Survival Guide for Parents on the Gotcha Wars now) . For curfew violations, wait the night out. Next day, spread the word to various friends that you are worried and you want your child to know s/he needs to come home and work out with you on what led to the run. Make it known you are more worried then angry. If school is in session, consider checking with the guidance department. The only reason not to do this is if the child has been labeled a trouble maker, then I would hesitate to involve them initially. If you, your family, or your child is in therapy, contact the therapist. You cannot officially report a child as missing to the police until 24 hours has passed. Still there is no harm in contacting the youth officer for advice. If the child is not a teen and has never been in trouble, the youth officer will most likely spread the word unofficially. If your child is a foster child, contact the agency. It the child has another parent living elsewhere, call them. If the other parents have involved you in a custody suit, call your lawyer. If anyone has charged you with child abuse – teens and other parents do this even when there is no abuse – it is also important to call your lawyer. When 24 hours have passed and you have decided to make an official missing child report, do not call 911. Instead go to the Police Precinct, ask to speak to the youth officer if there is one, to the sergeant on duty if there is not a youth officer. Take pictures with you as well as other identifying information including if you know it, what the child was wearing when she left the house. Parenting is hard work and contending with a child who runs to or from something can break your heart. Hopefully, the above tips and resources will help you and your child survive the stress and in time your child will find friends and a love that you welcome to your home and heart with great joy. You will find more detailed help in my E-book about running away or in my other books. You can find all listed on my Amazon’s author’s page. Scroll down the page for a listing of the E-books. If you buy one, please review it and as I mentioned earlier, When Good Kids Get You In A Gotcha War is available for free download at the moment. Finally, here is a thank you gift – The Daily 12 Emotional Fitness Exercises. These are easy to learn, easy to practice and easy to teach others. Click here to get see more detail about these exercises. As always thank you for following me, for your support. If you know someone else who will benefit from my thoughts, forward this to them. Liking, commenting, and sharing are other ways you can help me stay strong and spread some ideas others might find helpful. As I tell myself a thousand times a day, stay strong, give lots of love, be grateful, live now, practice kindness, give and seek forgiveness, and be hopeful the blessing of the forces beyond our control are with you and those you love. DISCLAIMER: FORGIVE MY GRAMMATICAL ERRORS FOR I HAVE DYSGRAPHIA. If you need perfect posts, you will not find them here. I have dysgraphia which means that sometimes my sentence structure is not that easy to follow or I make other errors. Still, most people understand me. All of my books are professionally edited, but not all of my blog posts are. If this troubles you, feel free to read elsewhere. If you persevere you are lifting my spirits for that means you find what I say helpful and that is one of my missions. This entry was posted in Parenting Issues and tagged Emotional fitness, Emotional Health, foster parents, parenting, Parenting advice, parenting teens, postaday, Self-care, teens, When good kids runaway. Bookmark the permalink.